The Pelican Sabrelite 2000PL with its laser spot 3.3W Xenon lamp is a practical and convenient dive light. You could use it to look under ledges and to restore natural color underwater. The light is also perfect for night dives. It is submersible to 3.28' (1.0 m). The SabreLite is made of unbreakable ABS material with a hi-impact polycarbonate lens. The light produces a tightly focused white light beam. The Sabrelite has a belt clip, stainless steel split ring and black lanyard making the light ideal for industrial, recreational, and home use as well as diving. The lens ring emits a bright glow in the dark. This generation of Photoluminescent material in the plastic absorbs the energy from any light source - fluorescent lights, the sun, or even the flashlight's own beam. 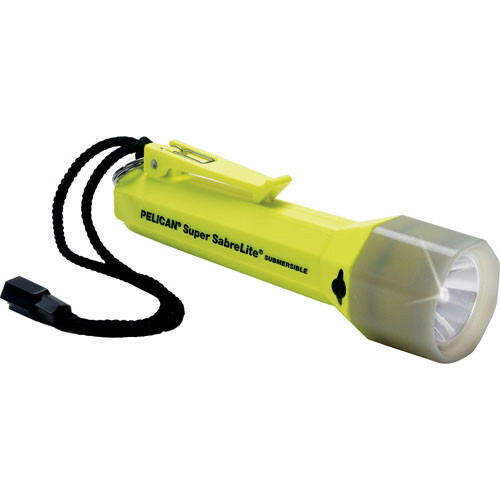 No more fumbling in the dark for your flashlight. Laser spot 3.3W Xenon lamp produces a tightly focused white light beam. Made of unbreakable ABS material with a hi-impact polycarbonate lens ideal for industrial, recreational, and home use as well as diving. Accidental turn on and mechanical switch failure is eliminated because of the rotary on/off switch. Safety battery tray prevents accidents if the battery cells are inverted. SR Class l; Div. 2; Gp ABCD, T3C; Class ll; Div. 2; Gp G.
Box Dimensions (LxWxH) 9.1 x 5.0 x 2.0"
Sabrelite 2000PL Photoluminescent Dive Light Xenon Lamp (Yellow) is rated 5.0 out of 5 by 1. Rated 5 out of 5 by Anonymous from Great light I wanted to have these lights at the reach of every family member in their bedroom. I have the same light at work and you can't beat it. Now I know if they need light in an emergency, they'll have it.